Castle Knight 2 review | What Hi-Fi? It's no secret that, since its founding (as Castle Acoustics Ltd) in 1973, Castle has had a bit of a time of it. This is by no means an unheard-of experience among British speaker manufacturers, and in this instance it's led to the brand being owned by Chinese behemoth International Audio Group. Castle isn't the only former UK speaker firm under the IAG umbrella, but the original company's angle of selling hand-crafted speakers made from natural materials and having real credentials as furniture remains the same. The new, five-strong Knight range is the initial evidence of this, and these ones are our first encounter. Being able to pass as furniture is only half the battle, of course – if the Knight 2s sound poor compared to their rivals, then all the cabinetry credentials in the world won't help them. But there's no doubt that they're off to a good start. Especially tactile thanks to the extensive waxing they undergo as part of the finishing process, the finish of our review pair features an interesting gradation from black to rosewood that makes them look like they've been only partially cleaned. Out in a bit of free space and securely sited on speaker stands with necessarily large top-plates (these are generously proportioned speakers. It's amazing how a few extra centimetres in each direction makes the Knight 2s seem so much bigger than many rivals), the Castles serve up a spotlessly tidy sound. Arcade Fire's Neighborhood #2 (Laïka) is a dense and messy recording, but the Knight 2s organise the song on a tight, unified soundstage that's easy to follow, despite the relative lack of breathing space. Taken in isolation, there's not much wrong with the way the Castles go about their work. High frequencies are rapid and detailed, and the midrange is equally expressive. Low frequencies don't have quite the detail levels, though they offer meaningful variation in texture and tonality, and they're every bit as fulsome as they ought to be – the Knight 2s won't thank you for positioning them too close to a side or rear wall. Despite the unanimity of their sound, though, the careful neutrality of the Castles can easily manifest itself as rather dour and unexciting. A song as giddy and abandoned as The Ramones' Sheena Is A Punk Rocker ought to gallop along with sparks flying, but under the Knight 2s' direction it's altogether too polite, too ordered and lacking in inspiration. For some listeners, of course, this control-freakery will be nothing but good news and, allied to the impressive build and finish, will make the Castles a very persuasive option. 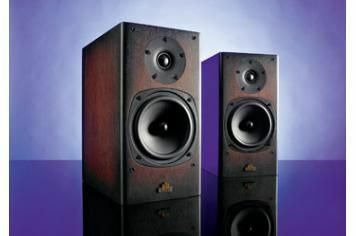 But some rivals such as the KEF Q300s are all able to slum it more effectively than the Knight 2s and, even at this relatively modest price, we think speakers should be more accomplished all-rounders than this.